Join the Food and revolution summit (it's free) to get the latest cutting-edge insights from 25 of the world most respected Food and Nutrition experts. 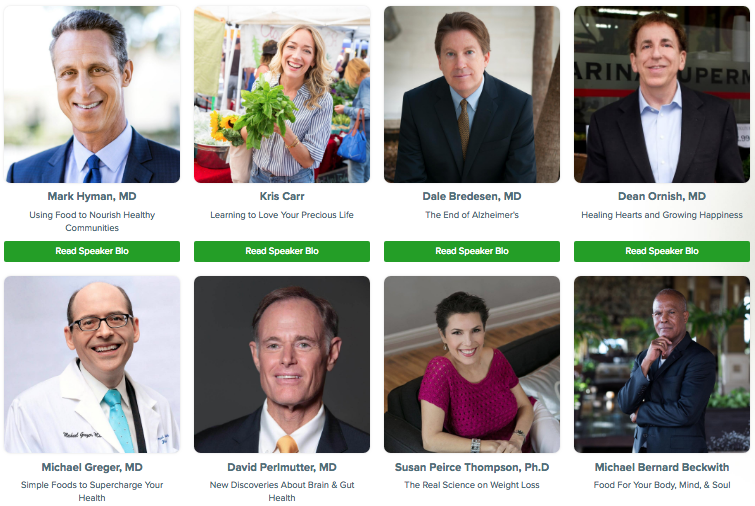 The speakers will bring up-to-date research and wisdom about food, nutrition, disease prevention and environmental stewardship. Is meat glue really good for you? Have you ever heard of meat glue? Yes, you heard that correctly, meat glue. If you eat meat and even tofu, chances are you eat this industry money saver called meat glue. What is it meat glue? It's a product derived from pigs or cows blood plasma, an enzyme with clotting properties that makes two protein containing foods glue together. It's sold as Transglutaminase Sprinkle Powder, TG Activa KS-LS and it comes in a white powder form that can be easily sprinkled on the foods you want to glue to each other. In a vulnerable industry selling perishable foods that can get spoiled so easily, drain their profits and put them out of business faster than any other, companies believe that Meat Glue came like a gift from heaven. But maybe not. Here you have a neat way to increase your profits by gluing cheap-small bits of meat to each other to appear like a premium-expensive looking larger cuts and sell them for double the price. It's like their dream come through, isn't it? Maybe, but for us consumers, it is a deceit and can become a living nightmare if we eat lots of it or don't cook the meat thoroughly as the restructuring process translocates surface contamination to the interior. According to a microbiologist interviewed by an Australian TV reporter, you are at a much greater risk of contracting food poisoning when eating glued meat. Food poisoning affects more than 4 million Australians a year and it's certainly not fun. You don't want to be one of them that's for sure. The product can glue fish, beef, lamb, sausages. bacon, patties, cheeses and in doing that you can end up eating the pork/beef blood glue stuff in your nuggets, hot dogs, tofu, yogurt, gluten-free products, even bread, and pastries. 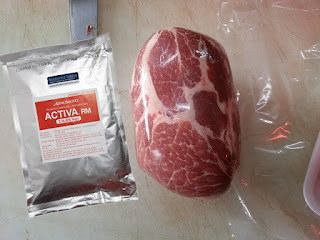 Products containing meat glue and sold in the store must indicate on the label that it has been "reformed from a single cut" or "formed from pieces of whole muscle meat". There is a great concern that some people may have an autoimmune reaction to the transglutaminase, the active ingredient in the meat glue. According to ANH-USA, of 288 people tested, 28% reacted to meat with glue compared with only 9% reacting to meat without glue. While watching the program, it struck me to see, that we are meant to believe this meat glue is safe for consumption, but it is not safe to breathe in. The butcher and the TV reporter were wearing masks to protect themselves while handling the product. Why? It must carry a hazard, they needed to be protected against. What is the difference between ingesting or breathing it in? I imagine it is the amount and the concentration of it that makes all the difference but that is just my best guess. Mental diseases, Alzheimer, dementia, allergies, cancer rates are up. Turns out that our doctors don't have all the answers. Things that were inoffensive yesterday, like smoking or antibiotics we are told now, they may harm us or even cause cancer. It is time to start being proactive about our health. We become what we eat, we like it or not. Our tomorrow's health starts today. Be informed. Be proactive. Get back to the kitchen like your life depends on it. By the time you will hear that on the news, it may be a bit too late.